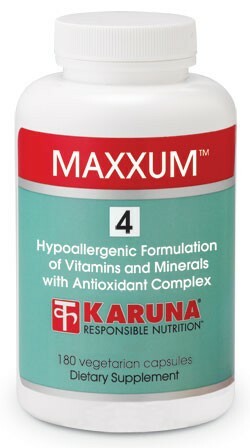 MAXXUM 4 is a comprehensive iron-free multi with an advanced antioxidant and flavonoid complex for free radical scavenging. Broad antioxidant support includes lutein and zeaxanthin for macular health, lycopene for cellular wellness, and alpha-carotene and cryptoxanthin for lung health. Citrus bioflavonoids complement the absorption of vitamin C.
MAXXUM 4 is designed to combine the benefits of a quality vitamin-mineral supplement with additional antioxidants such as alpha-carotene, lutein, lycopene, and citrus bioflavonoids. Lycopene, one of the most abundant carotenoids in the body, has been associated in human studies with optimum immune function (Proc Nutr Soc 1998;57:3A) and prostate health (Nutr Cancer 1999;33:159-64). Antioxidant combinations provide protection to the skin from ultraviolet radiation (Photodermatol Photo-immunol Photomed 2003;19: 182-9; J Am Acad Dermatol 1998; 38:45-8). Citrus bioflavonoids enhance the absorption of vitamin C, and together they have synergistic activity in promoting healthy gingival tissues (Am J Clin Nutr 1988;48:601-4; J Periodontol 1964;35:250-9). Suggested use for adults: Six capsules daily, taken with meals, or as directed.